The landscape, culture, history, creatures and architecture of some of Asia’s most exotic and intriguing countries are found in Animal Kingdom’s newest land. Lush vegetation, crumbling ruins and mysterious temples were borrowed from countries such as Nepal, Mongolia, Indonesia, Cambodia, Thailand and India, to form the cultural melting pot that is the mythical kingdom of Anandapur.Disney used many nations that were not culturally specific, as opposed to one actual country, in the birth of Anandapur, which means “place of all delights.” According to the “Disney history” of Anadapur, it was established in 1544 as a royal hunting reserve. A village evolved from this base and thrived, while the reserve has found itself in a state of ruin and decay. The “current” royal family converted the crumbling reserve into its current state as a conservation area. Bollywood Beats, an Indian dance experience, will be performed several times daily on the stage across from the Anandapur Theater in Asia. Bollywood brings traditional Indian dance together with the fire of Hindi film. 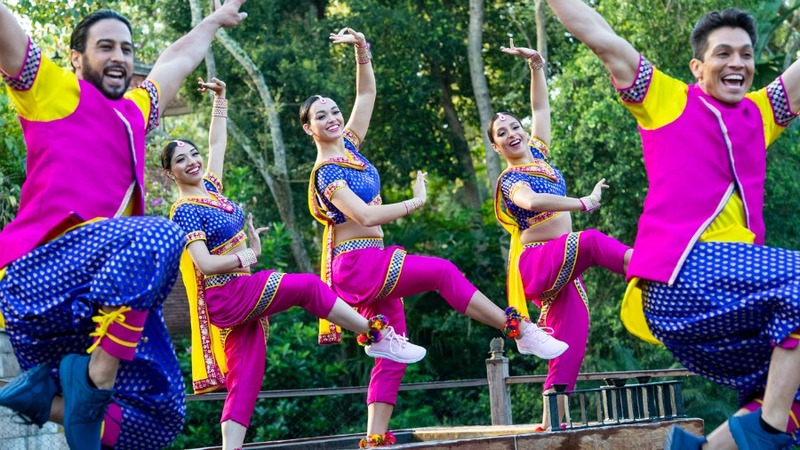 From classical Indian rhythms of Kathak to the proud folk style of Bhangra to modern Bollywood popular dance, the performers of Bollywood Beats have something for every dance lover to enjoy in this spirited interactive performance. Pick up a Times Guide at the park entrance to see a schedule. As you explore this enchanting land, you can hear the clack of the bamboo as the wind rattles through the forest. See the Tiger Tree, decorated with scarves, garlands and bells as a tribute to the spirits for wishes and prayers that have been granted. The cement walkways are imprinted with leaves and palm fronds and are flanked by bicycles, rickshaws and other interesting transportation options. With the two 50-foot monument pillars in the background, bamboo scaffolding surrounds two structures as part of a restoration project, and has become home to 2 families of gibbons. The Siamangs have strong family bonds and perform their playful gymnastics to the delight of the entertained audience. The white-cheeked gibbons, whose hoots can be heard throughout the land, inhabit the second pillar. Bird lovers will be enchanted by the graceful, soaring birds in the Flights of Wonder performances. Visitors to the Kali River Rapids will be enlightened to the devastating effects that illegal logging operations are having on the rainforest, as they travel the churning waters of the rapids. Meander along the pathways of the Maharajah Jungle Trek and see some of Asia’s most exotic creatures. Hungry guests can snack on the chicken satay and roasted corn that are available from a roadside stand. The colorful Anandapur Ice Cream truck serves frozen treats in addition to smoothies and floats.On hot days, cold drinks are found at Drinkwallah. At Mandala Gifts, you’ll find such Asian treasures as stuffed tigers, strings of melodious bells, jewelry, masks and tiger apparel. 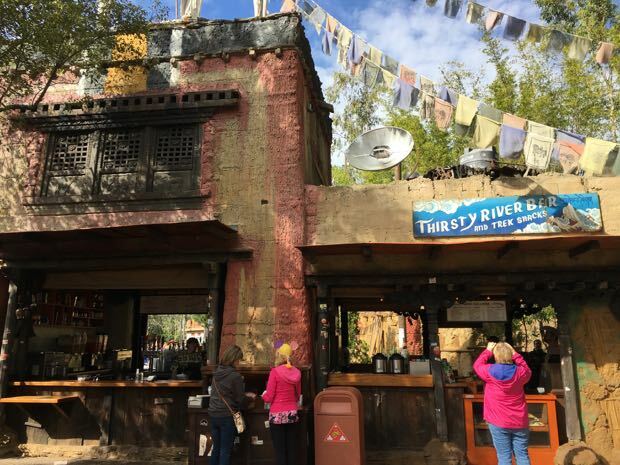 The Thirsty River Bar and Trek Snacks is located near Expedition Everest. The food offerings at Trek Snacks changes through the day; pastries are offered in the morning and sushi and sandwiches in the afternoon/evening. There are such snacks as fresh fruit, veggies and hummas, an Asian noodle salad, a Smoked Turkey Sandwich, Bahn Mi (roasted pork topped with pickled vegetables, cilantro and sriracha dressing), Som Tam (Thai shrimp, green papaya salad, crushed peanuts and chilis) and sushi. Desserts such as cookies, brownies and ice cream are also available. Specialty cocktails are offered at the Thirsty River Bar, like the Khumbu Icefall (guava rum blended with coconut and raspberry puree), Himalayan Ghost (Snow Leopard vodka, guava, and Odwalla lemonade) and Durbar Margarita. Non-alcoholic drinks are available as well. The storyline goes that this was the home for a popular Sherpa family at the base camp of Everest climbers, so the walls are covered with travelers' mementos. A stop at this bar is considered tradition for climbers returning from an expedition.